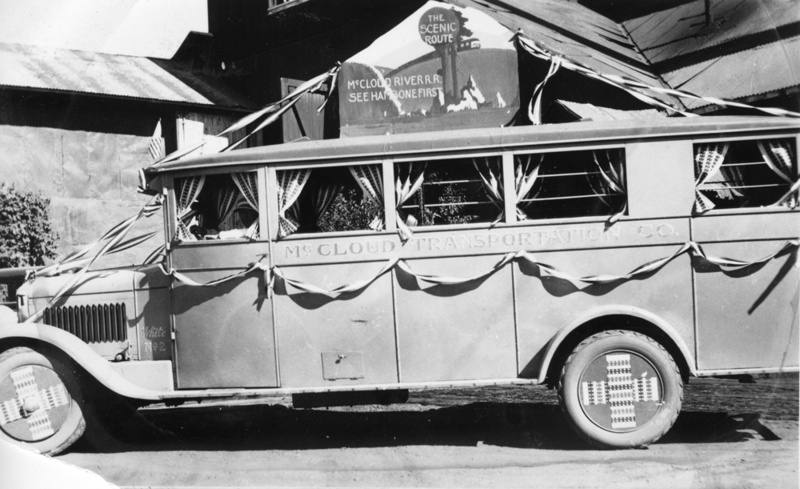 McCloud River Railroad/McCloud Transportation Company Bus #2 decked out for a parade. T.E. Glover Collection. Declining passenger revenues in the face of auto stage competition and increasing private automobile ownership as the 1920s progressed forced the McCloud River Railroad to seek ways to economize its passenger, express, and mail service. Buses were the obvious answer, and in 1927 the railroad purchased two of them, with a third added the following year. The buses immediately assumed all but one of the daily round trips between McCloud and Mt. Shasta City. The service also prompted the already established bus line to file a series of lawsuits against the railroad, claiming (correctly) that the railroad launched the service without first securing the proper certificates and approvals. The railroad eventually bought the plaintiff bus line, but that didn't stop the former owners from continuing litigation against the railroad for several more years. Despite the legal problems, the buses proved very successful. On 1 september 1929 the railroad sold the three buses and the garage the company built on the east side of the McCloud yard to house and mainain them to the McCloud Transportation Company, a subsidiary of the railroad. McCloud Transportation Company handled the bus service until February 1937, when the railroad dissolved the subsidiary and repurchased the bus assetts. The buses continued providing two round trips a day, with a third trip added on Sundays during some periods of time, for the next several decades. 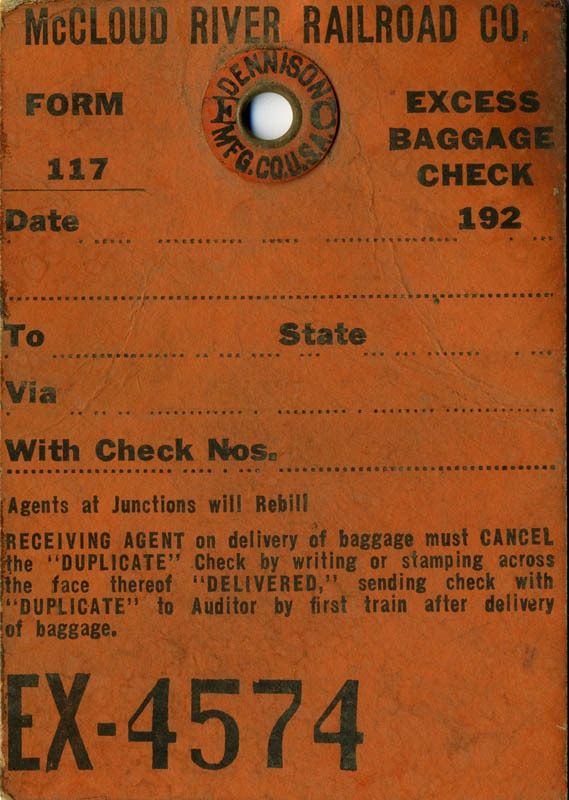 By the early 1960s passenger counts dwindled to nearly nothing, and more days than not the company only ran the bus to handle the railroad's mail contract. However, the post office cancelled that contract on 25 April 1964, and the railroad promptly cut service from twice daily to once a week. The railroad applied to the California Public Utility Commission for permission to suspend the service, stating in its application the company had only earned $239 in gross passenger revenues in 1963 and had carried only 97 passengers generating $44.45 in revenue in the the first three months of 1964. The Commission issued an order allowing the railroad to cease the passenger operations on 14 July 1964, and the last buses ran shortly thereafter. Bus 1- White, purchased 4/1927. Cost $6,376.70. Sold 9/1/1929 to McCloud Transportation Company; repurchased 2/1937. Retired 5/1937. Bus 2- White, purchased 7/1927. Cost $4,420.60. Sold 9/1/1929 to McCloud Transportation Company; repurchased 2/1937. Retired 8/1938. Bus 3- Studebaker, purchased 1/1928. Cost $900. Sold 9/1/1929 to McCloud Transportation Company. Retired prior to 1937. Bus 4- GMC panel bus, 6-cylinder, 6-wheel, purchased 6/1937. Cost $1,278.12. Retired 1946. Bus 5- GMC suburban carryall, 6-cylinder, 4-wheel, purchased 6/1937. Cost $1,058.66. Bus 6- Ford panel bus, purchased 4/1941. Cost $1144.70. Retired 1951. Bus 7- Studebaker 13-passenger bus, purchased 8/1946 from Gilling Brothers. Cost $5,161.66. Retired 1953. Bus 8- Wayne-GMC bus. Purchased 10/1953 from Crown Body & Coach Corp. Bus 9(? )- 1960 Wayne-GMC bus. Ordered new 3/22/1960. 133" wheel base, GMC chassis, 4-speed synchromesh transmission, 150-h.p. Y6 engine, heavy duty cooling, heavy duty fan, heavy duty generator, vacuum reserve tank, six 5.22-5 10-ply tubeless tires, 12-volt electrical system, engine vacuum gauge, spare tire carrier and spare wheel, Wayne model SC01406 Super Custom Body with two rows of 39" seats, heavy duty 42-oz. upholstery, body length 14'6", to have center rear emergency exit, 6"x16" exterior mirrors, Solex tinted windshield, 80,000 b.t.u. front heater and defroster, 2 red reflectors, extra tail lights, self canceling extra large stop lights, aluminum seat backs, drive shaft guard, fog lights, two 1-qt. fire extinguishers, all railroad crossing signs, 24 mounted first aid kits, rear door buzzer and telltale dash light. Net price f.o.b. Richmond, Indiana- $4,406.71. Optional equipment- one set flags/flares ($3), one 5-lb. dry chemical fire extinguisher ($8.50), 5" white lettering at $0.40 per letter, and electric windshield wipers at $27.56. Bus ticket. Jeff Moore collection. 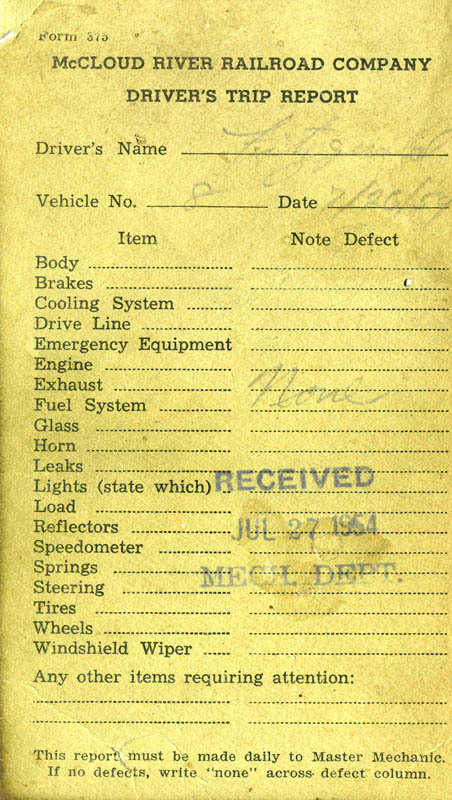 Driver's daily report for Bus 8 from 26 July 1959. Jeff Moore collection. Excess baggage tag. Jeff Moore collection.